Parker, Smith & Feek was named the #1 Best Insurance, Bonding, & Surety provider by Oregon’s Daily Journal of Commerce Reader Rankings. The DJC surveyed more than 4,000 subscribers and PS&F was voted #1 in this category. The Independent Insurance Agents & Brokers of America (IIABA) is the nation’s oldest and largest national association of independent insurance agents and brokers, representing a network of more than 300,000 agents, brokers and their employees nationally. Parker, Smith & Feek was nominated for this award based on our operational excellence and is honored to be one of an exclusive group of firms to be named an IIABA Best Practices Agency. Parker, Smith & Feek has long been dedicated to creating a supportive work environment for our hard-working employees. 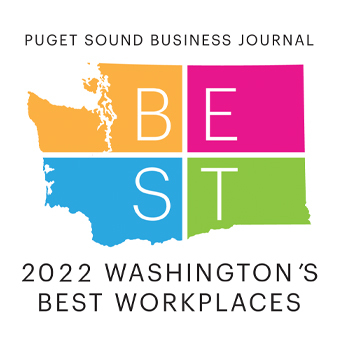 We have been selected as one of Puget Sound Business Journal’s Washington’s Best Workplaces two years running. Parker, Smith & Feek was named as a 2014 Elite Agency by Insurance Business America. Independent agencies were selected for their innovation, exceptional client service, employee satisfaction and contributions to their communities. One of 35 firms recognized, PS&F is the only broker in Washington & Alaska given this honor. National Underwriter Magazine named Parker, Smith & Feek “2011 Agency of Year.” This prestigious award is based on a thorough evaluation of agency growth and development, management of client relationships, technology aptitude and efficiency, innovative solutions to sales challenges, and maintenance of brand identity. Our firm also received the Technology and Operations Award for Excellence. In addition to winning the National Underwriter Magazine “2011 Agency of Year.” Parker, Smith & Feek was also named as overall champion in the “Technology and Operations” category. Recognizing Parker, Smith & Feek as a firm that “shows its innovative streak with a proprietary suite of software” developed internally, to deliver superior service to our clients. Parker, Smith & Feek was awarded the Best Practices Agency designation by the Independent Insurance Agents & Brokers of America (IIABA) “Best Practices” Study Group. Criteria for the designation include outstanding customer service, growth, stability and financial management. The purpose of IIABA’s Best Practices Study is to document the business practices of the country’s leading agents and brokers. Our inclusion with this select group of outstanding agents and brokers is recognition of our firm as an industry leader. Parker, Smith & Feek was selected as a Top Corporate Citizens by the Bellevue Chamber of Commerce. The award was presented to Parker, Smith & Feek in recognition of our commitment to making the Eastside one of the best places to live, work and launch a business.